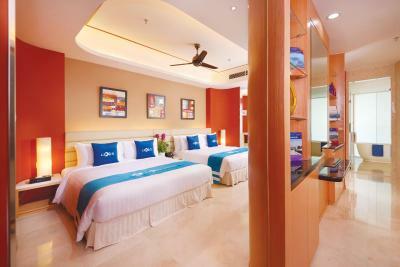 Lock in a great price for Lexis Hibiscus Port Dickson – rated 8.4 by recent guests! View from room was excellent..we booked premium sea view Villa..buggy service was excellent..
Privacy. Private pool, bed is good. Breakfast should be better. The breakfast is great. A lot of choices. From Malay dishes, Indian, Chinese and Western. And all taste so great. Good hotel facilites, nice sea view from the room, varities choices of breakfast buffet and taste good, overall nice ambience & beautiful environment, friendly and helpful front desk staff. Superb breakfast, the best vegetarian friendly buffet. Very clean and perfect room for 4 adults. Clean swimming pool on all rooms. Best place to relax with family or friends. Highly recommended for those whom seek something different then standard hotel stay. Lexis Hibiscus Port Dickson This rating is a reflection of how the property compares to the industry standard when it comes to price, facilities and services available. It's based on a self-evaluation by the property. Use this rating to help choose your stay! One of our top picks in Port Dickson.Offering an outdoor pool and an indoor pool, Lexis Hibiscus Port Dickson is in Port Dickson. Free Wi-Fi access is available in this chalet. The accommodations includes air conditioning and a minibar. Featuring a hairdryer, private bathroom also comes with a bidet and bathrobes. Extras include a private pool, a desk and ironing facilities. At Lexis Hibiscus Port Dickson there is a restaurant. Other facilities offered at the property include a shared lounge and luggage storage. The property provides free parking. This chalet is 28 miles from Kuala Lumpur International Airport. This property is also rated for the best value in Port Dickson! Guests are getting more for their money when compared to other properties in this city. When would you like to stay at Lexis Hibiscus Port Dickson? This lodging features 2 king beds and a transparent glass floor panel for underneath seawater viewing. Located at the hibiscus petal area, this villa features floor-to-ceiling glass windows that offer a sense of spaciousness. The Premium Pool Villas are contemporarily decorated, with an option of partial sea view, fountain view or scenic views of surrounding villas. Situated onshore, the logging offers guests a picturesque view of the resort and the seafront beyond. Spaciously built, each unit is bathed in a bright and warm color scheme with contemporary furniture to match. This villa features a bathrobe, tile/marble floor and private pool. Decked in warm earthen tones, this villa offers sea views from the balcony. It is fitted with comfortable furniture as well as a spacious bathroom. These premium units are not exposed to the walkways and do not have other units facing its pool directly. Adorned with modern furnishings and a contemporary color scheme within an expansive abode, this sea-facing pool villa enjoys a sense of privacy. This premium unit is not exposed to the walkways and does not have other units facing its pool directly. Luxuriously furnished, this spacious duplex suite features 4 bedrooms with private bathroom, a lavish living and dining area, and a kitchenette with bar. It features 2 private dipping pools, a hot tub in the balcony and multiple steam rooms. Suite offers either uninterrupted views of the sea, or a breathtaking view of the Grand Fountain, Malaysia's tallest sea-water fountain. Elegantly furnished, this stylish suite for 6 people feature 3 King-sized beds in two bedrooms, a deluxe living and dining area, and a kitchenette with bar. Suite offers either uninterrupted views of the sea, or a breathtaking view of the Grand Fountain, Malaysia's tallest sea-water fountain. Nestled along Port Dickson’s pristine Pasir Panjang beach, Lexis Hibiscus consists of 639 pool villas comprising tower rooms and water villas. Each villa is spacious, tastefully decorated with modern conveniences and comes with its own private dip pool and steam room for luxury and privacy. Complementing the rooms are a wide range of beach and water activities, all focused around the tallest sea water fountain in Malaysia at 400 feet. House Rules Lexis Hibiscus Port Dickson takes special requests – add in the next step! Lexis Hibiscus Port Dickson accepts these cards and reserves the right to temporarily hold an amount prior to arrival. Please note that if guests wish to secure rooms with certain views, surcharges are applicable. Please note that extra beds cannot be provided in all rooms. Complimentary for children below 4 years old sharing existing bedding with parents. Please note that the property will only issue an official receipt upon receiving the deposit or part/full settlement of amount due from you, prior to your stay or event at the hotel. A tax invoice will only be issued upon completion of services rendered by the hotel. Third party credit cards are not accepted for payments. Please inform Lexis Hibiscus Port Dickson of your expected arrival time in advance. You can use the Special Requests box when booking, or contact the property directly using the contact details in your confirmation. The overall view, place for eat & the room pool. Everything was very nice. I will come again for my next vacation. Omaigod cannot wait!